Teena was away with her sister last week in the Bahamas. When she came back home yesterday, she brought beer from the only two Bahamas Breweries, Sands Beer from The Bahamian Brewery and Kalik Beer from Commonwealth Brewery. Sands is only available in the Bahamas and Kalik has a U.S. distributor. I could find out very little about Commonwealth Brewery except that it is owned by by Heineken International. Heineken did some market research before developing the recipe for Kalik Beer in 1988 based on its findings. According to one article, more than 50% of the beer sold in the Bahamas is Kalik. 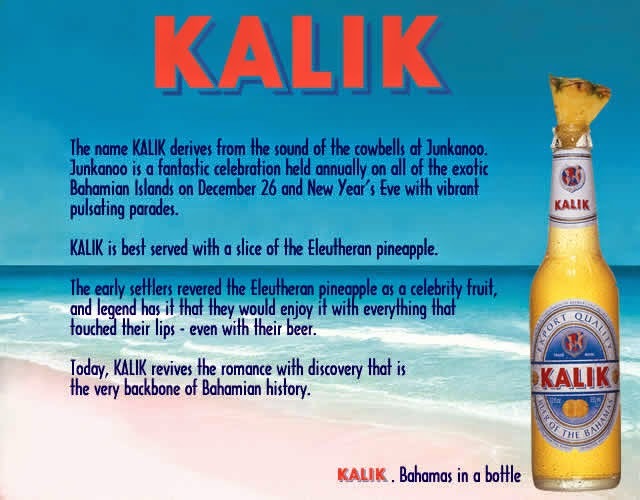 Although it does not say it on the can but does on the bottle, that the name Kalik came from cowbells heard during Junkanoo an annual Bahamian festival. Special beer labels commemorating Junkanoo are produced each year. Kalik pours a light golden colour with a short white head. The head dissipates quickly which I find very common in lagers. The aroma is rather biscuity and I cannot detect any hop aroma. The beer starts off a little watery but is followed up with some mild bitterness which increases slightly into an enjoyable finish. Overall a very decent lager. This is a relative newcomer to the Bahama's beer market, which opened up in 2008. This brewery is 100% Bahamian owned and operated by James "Jimmy" Sands. Guess who the beer is named after? The opening of this brewery has created a beer war on the islands and according to one article I read, it is becoming a little nasty. Teena said that she when she tried the Sands Beer, she liked it and it became her beer of choice while she was there. Sands was originally brewed to be sold in Grand Bahama only but in its first months became so popular that it became a national Bahamian brand for the company. The beer pours a very light and clear straw colour and is quite easy to see through. There is a light biscuit tone to the aroma. The beer poured with a big active, white head that disappeared fairly quickly. This is a very light tasting beer. There is not a lot of flavour throughout and just a hint of hops in the finish. I can't say that I really enjoyed it,but didn't dislike it as there is very little flavour to dislike. It's just not my style of lager. If I were ever in the Bahamas, Kalik would be my go-to beer but I would be interested in trying the Strong Back Stout from Bahamian Brewery. When Teena came home, she not only brought beer but a couple of different Bahama rums. Thanks, Teena, for bringing home a taste of the Bahamas for me!